July 7 we drove down to Petra on the windy, hilly and at times very scenic King’s Highway to stay at the Movenpick resort and celebrate our joint birthdays July 8 (yup, we share the day… Evan’s 5 hours older than me). 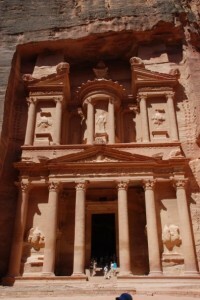 We got up early on the 8th to try to beat the heat a bit, but had to do a few things, like get more cash in town, before we could get to the main event of the day — exploring Petra. When we finally got our tickets, it was already quite warm, but much of the path down to the site was in shady canyons, so we felt like we were doing fine. We walked past carvings in the gorge, and got more and more excited to get to finally see Petra’s famed Treasury as we continued our descent. Finally, we reached the end of the narrow canyon and lo and behold, the Treasury was right in front of us — a giant, pillared building hewn out of the pink rock. We walked on further, past elaborate tombs, an amphitheater and other grand structures carved into the sandstone. We made it all the way to the center of the ancient Nabataean town before I started feeling ill. I hadn’t been able to eat much since my stomach troubles the day we went to the dead sea, and though I was trying to drink plenty of water and electrolyte drinks, they didn’t seem to be enough. We started the long walk back in the midday sun, trying to find any shade we could, and finally got a horse carriage to take us up the last long, completely exposed stretch. When we got back to the hotel, Evan called a doctor, who insisted on taking me to his clinic to get IV fluids and antibiotics since my blood pressure was very low. He struggled to get the IV in, which was quite painful, and the doctors weren’t explaining everything they were doing as I lay on the bed in their un-air-conditioned clinic, which made me a bit anxious. Evan sat by my side, held my hand and read me stories from the Neil Gaiman book we brought along (Smoke and Mirrors, which is really good, by the way) and I was sent back to the hotel about four hours later, IV setup still in my hand because I still needed another dose that evening. Somehow, I also managed to lose my sunglasses somewhere between the security checkpoint and our room on the way in from Petra… we looked everywhere trying to find them, but to no avail. I bought a new pair in Aqaba. We had a quiet birthday dinner courtesy of room service, and Evan even had a cake made for us — it was strawberry shortcake decorated with an assortment of fruit. The doctor came to see me shortly before midnight to give me another dose of IV antibiotics, and he brought me a birthday present, a decorative sand jar that had my name and camels on one side and “Happy Bearthday” on the other. The next day, I felt much better and we took it easy, taking a small drive to “Little Petra,” another gorge with carved-out structures. 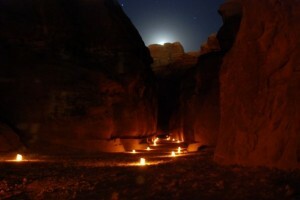 We made it back into Petra at night to experience the walk down to the treasury by candlelight, which was really nice. It was still warm, but not too hot, and the candles glowing amber in paper bags lined with sand gave a wonderful ambiance to the place. Evan and I even saw a shooting star on our walk out. On the 10th, we got up early to get to Petra before the sun — when it opened at 6 a.m. We had the place to ourselves. Even the shopkeepers and donkey and camel guides were still asleep (many of them just sleep right there in Petra, on cots or mats outside or in caves). We explored the East Cliff and took the staircase hike up to the High Place of Sacrifice, which gave us some great views. That afternoon we went down to Aqaba, on the Red Sea, which is probably Jordan’s most beautiful and scenic town, but with the temperatures soaring well over 100 degrees, it was too hot to do much of anything, and we headed back up to Madaba on the 11th to relax before we head off to Istanbul. We didn’t make it to Wadi Rum to go camping in the desert because I’m still not feeling 100% better, but Jordan has been an amazing place to travel and I’d love to come back to spend more time here. 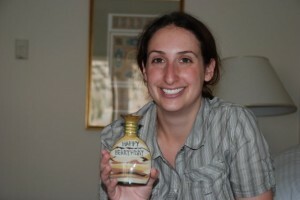 You can see all our photos of Petra in Evan’s Facebook gallery. 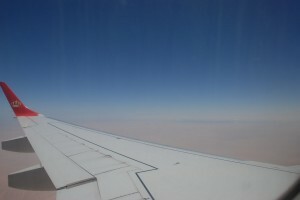 July 6, we went to Hammamat Ma’in and the Dead Sea. Hammamat Ma’in is a hot spring complex off a windy road with views of the Dead Sea. We got past the gates, where there’s a hotel and spa (which are both closed and apparently everything by them is off limits), parked, and were directed to the main attraction — a hot waterfall. We walked up the steps to the caves behind the waterfall and found two men sitting in the steam who told us that the water up there is too hot to go in. 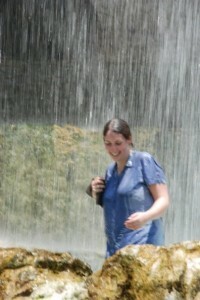 On the lower tiers, under the falling water, the temperature was a bit cooler, but not much. We were only able to stay in the water for a few minutes before getting too hot. I went in wearing my shirt and Evan’s shorts since there were some families also in the water, and the women were just going in wearing all their clothing, veils included. There was also another waterfall we had access to, but nobody was swimming in it because it was even hotter than the one we went in. Our guidebook promised nice walks through the gorge, which we were hoping to do, but we were turned back by guards every time we tried to explore farther than the main waterfall, which was a bit disappointing. After the hot springs, we drove on a winding road down to the lowest place on earth — the Dead Sea. 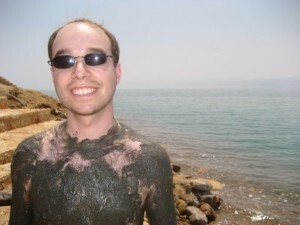 We got day passes to the Marriott resort, and went down to the beach to slather ourselves in dead sea mud, bake in the heat, and float around in the seriously salty water, which didn’t feel as slimy as I remembered from my trip to Israel 10 years ago. When we were done by the sea, we had some lunch at a Champion’s sports bar, which felt eerily like being back in the U.S., then hung out by one of the three pools. If you’ve been following my Twitter or Facebook updates, you should know that this is the day that my dehydration problems started — a rather uncomfortable combo of a stomach bug and not being able to absorb enough water, which resulted in spending the afternoon in a clinic getting IV fluids and antibiotics two days later… on both Evan’s and my birthday. More on that soon. To check out more photos of us at Hammamat Ma’in and the Dead Sea, check out Evan’s Facebook gallery. We arrived in Jordan yesterday afternoon and immediately felt more at home than in Cairo. The visa process was a snap, the passport control lines were short and we had our bags and a rental car pretty quickly. Our hotel in Madaba, a small town not far from the capital, Amman, was easy to find, even when using a map without many street names labeled. Actually, it’s been easy to get around everywhere, since the exits are clearly marked and the roads are well maintained. 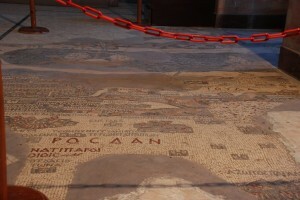 We spent the afternoon exploring Madaba, which is known for its Byzantine mosaics. We visited the Church of St. George to see the mosaic floor map of the Holy Land from the 6th century A.D. (I think), then went to another site nearby to see a collection of very detailed mosaics from other ancient churches and homes, many of which were incredibly large, intact and vibrant. We also visited the town mosque — a new pretty building with a gold dome from the outside that’s actually painted a pale pink on the inside. 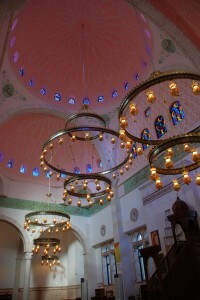 It also had some impressively large chandeliers. 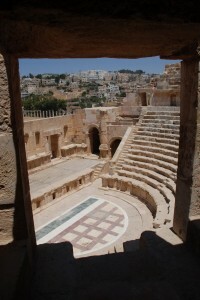 Today we headed north to see the Roman ruins at Jerash and the crusades-era castle at Ajloun. Jerash was absolutely amazing — it’s been restored so that many of the main public areas in the town are intact, and there’s plenty to see on the huge site, including triple-arched gates, a hippodrome, two theaters (which they still use for concerts), 8 ruined churches and temples, and impressive oval courtyard surrounded by columns, and a long main road, the cardo, also lined with columns. 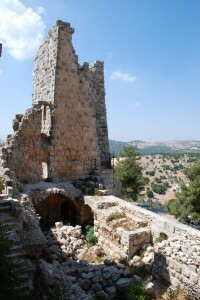 After Jerash, we headed west through the mountains to Ajloun, where a castle sits atop a high peak. We explored the vast rooms, saw some great views from the top of the towers and had fun exploring the many hallways, doorways and other areas open to visitors. See more pictures in Evan’s Facebook Gallery. We haven’t booked our ticket yet, but we met with a travel agent on Saturday about it and are going back in a couple of weeks to really sort things out. It looks like we’ll be getting some sort of around-the-world ticket, which is flexible on dates, though less flexible on destinations once we pick them. So now we need help — we want to know what to see, where to stay, what and where to eat, which guide to get, and all your other travel tips for these destinations. Please post them in the comments or email them directly to me. And if you have friends and family who have been to these places, please ask them to share, too.